The VScom 200E PCIex is a smart 2-ports PCI Express serial card, designed for industrial automation and POS/ATM applications. 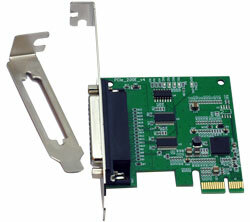 VScom 200E PCIex runs with all major operating systems. The serial ports equipped with 256 byte FIFOs support data rates up to 500kbps and use full modem control signals for compatibility with a wide range of serial devices. The ports also allow every non-standard bitrate up to 500kbps. On-chip s/w and h/w flow control ensure quick reaction and so error free data transmission at high baud rates. Serial ports are ESD and surge protected. The board can be plugged into Standard Height and Low-Profile PC cases. Mounted is the standard bracket, Low Profile is placed in the box. 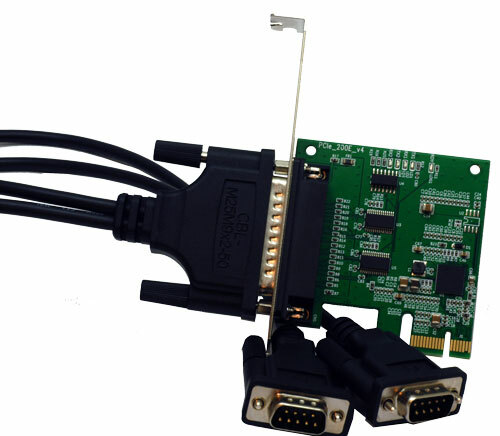 Also included is the adapter cable DB25F to 2 x DB9M (Pins and signals like on a PC).